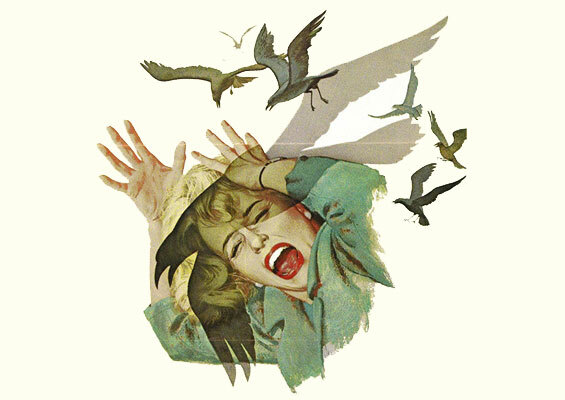 Original poster artwork from the 1963 horror film, The Birds. Happy Halloween! This weekend I celebrated the sinister holiday in style as Tippi Hedren's character Melanie Daniels in The Birds. The 1963 Hitchcock horror film left bird fearers, such as my mother, petrified at the thought of massive bird attacks. Outfit: Blonde wig - Halloween store in West Edmonton Mall. Fake birds - Superstore. Dress - perfect vintage find from Decadence. You're costume is hilarious, nicely done! aaah! amazing costume idea! love it, you killed it! Oh my God Janis this is hilarious! What a great costume! And you look HOT as a blonde!! I love your Halloween costume, so creative and you looked cute too! !